INTRODUCTION: Frigato identifies two areas of the cingulate brain region, the anterior cingulate and the precuneus-posterior cingulate as necessary for consciousness, while eight other areas, the medial-superior temporal lobe, the anterior and posterior insulas, the superior and inferior parietal, the inferior frontal and two motor cortices are involved at various stages in conscious processing. Frigato says that his own research concurs with the idea of points of convergence in the brain where both a perception and the memories and emotions related to that perception can be held in the same neural structure. The brain stem is identified as necessary for consciousness, but damage to the brain stem can also oblate unconscious processing. The author is interested in finding an area that is dedicated solely to consciousness. This means brain areas where damage removes consciousness, but does not prevent unconscious processing. This leads him to identify the anterior cingulate and the precuneus-posterior cingulate as areas where damage can cause total loss of consciousness. 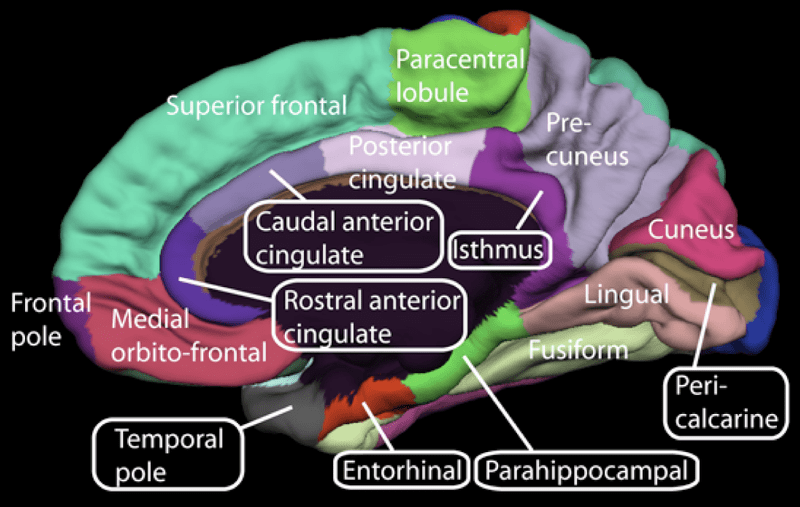 The anterior cingulate is seen as being related to attention while the precuneus-posterior cingulate is related to memory and mental images. Damage to the eight other areas identified in this paper only cause loss of consciousness of particular functions. For instance, damage to medial-temporal cortex results in the inability to recognise objects; damage to the superior parietal results in an inability to perceive more than one object at a time; damage to frontal motor areas can impair voluntary movement; damage to the inferior parietal impairs awareness of the position of the body. Further to this, damage to just one of the eight areas detailed by the author on the right side of the brain results in left side neglect in terms of behaviour and actions because of a dependence on interactions between the eight areas. Primary visual areas are activated within 150 ms after the initial signal input; within 200ms of the initial signal there is activation of the inferior temporal, and within 350-400 ms the image is conscious in the medial-superior temporal lobe. The medial-superior temporal is seen as communicating both with the inferior temporal and with the precuneus-posterior cingulate. The precuneus activates visual memories while still projecting to the new inputs of the inferior temporal. The system involves a constant feedback between neurons involved with new stimuli and neurons involved with memory. Neurons in the inferior temporal, the medial-superior temporal and the precuneus are active both for external signals and for images stores in the memory. The anterior cingulate cortex has a central role in processing emotional experiences at the conscious level and selective attentional responses. 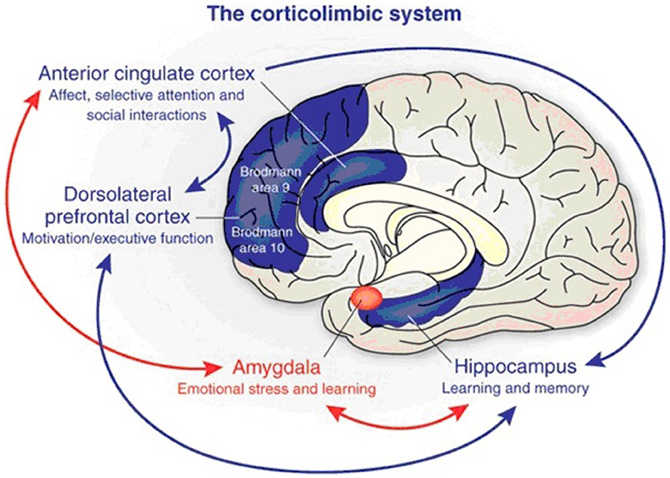 Emotionally related learning is mediated through the interactions of the basolateral amygdala and hippocampal formation and motivational responses are processed through the dorsolateral prefrontal cortex (from Benes, 2010). The author describes a process by which the anterior cingulate, seen here as the basis of attention, activates the medial-superior temporal lobe region for 300 ms, in which time a perception can be developed in the inferior temporal lobe and can interact with images held in memory. Only images that will later become conscious reach the inferior temporal level. In the 300ms period that it takes the image to reach full development in the inferior temporal, the anterior cingulate is seen as activating the medial-superior temporal and other regions of the brain involved in conscious processing. It is suggested that activity in the anterior cingulate could allow other convergences for instance between neurons in the superior parietal, involved with positions of objects on the one hand, and stored memories of object positions on the other hand. Damage in the areas listed by the author prevents the formation of mental images in the stored memory, and it is suggested that the role of consciousness in storing such memories is one of the evolutionary advantages of being conscious. Such images can subsequently be used in making predictions as to the outcome of possible actions. Convergences in the brain involve not only new stimuli and memories but also emotional evaluations of the reward/punisher nature of conscious stimuli.